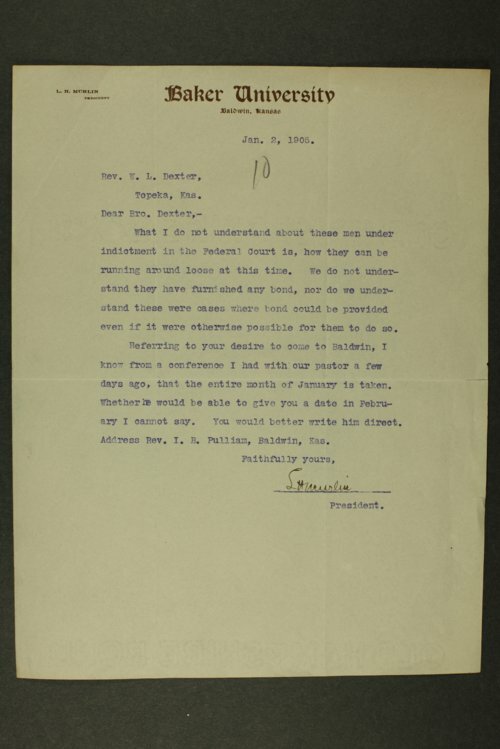 Correspondence sent and received by members of the Kansas State Temperance Union, primarily Rev. W. L. Dexter, secretary, Robert Norris, secretary, Julian K. Codding, lawyer, and William T. Jones, solicitor. Correspondents include Elizabeth P. Hutchinson, president of the Woman's Christian Temperance Union, Rev. Purley A. Baker, superintendent of the American Anti-Saloon League, Mary Evelyn Dobbs, Rev. Charles W. Whorrall, and William H. McCamish, assistant attorney general of Wyandotte County. Included in this correspondence are several signed petitions to members of the U.S. Senate from citizens in Arkansas City, Kirwin, and Abilene asking them to vote against the Hamilton Bill which they argue "would annul the solemn pledge of the Government to protect the Indians against the introduction and sale of intoxicants in the Indian territory." Some financial records are also included, such as a report from the finance committee for the previous year, ending February 15, 1905, and receipts and disbursements by month, signed by financial manager S. H. Pitcher. Although Kansas was the first state to adopt a constitutional amendment prohibiting the sale of intoxicating liquors in 1880, the law was largely unenforced.